One of the most important holiday in Japan. News Years is a holiday that is steeped in cultural and historic significance. The New Year’s holidayお正月・おしょうがつ, is the most important 祝日しゅくじゅつ・holiday period in Japan. The Chinese lunar calendar dictated the dates of Japan’s New Year until 1873 when the Meiji Government adopted the Gregorian calendar as part of its efforts to modernize Japan. Today, New Year’s is celebrated on 元旦がんたん・News Years Day, but many businesses are closed from December 29th to January 3rd in observation of the holiday. 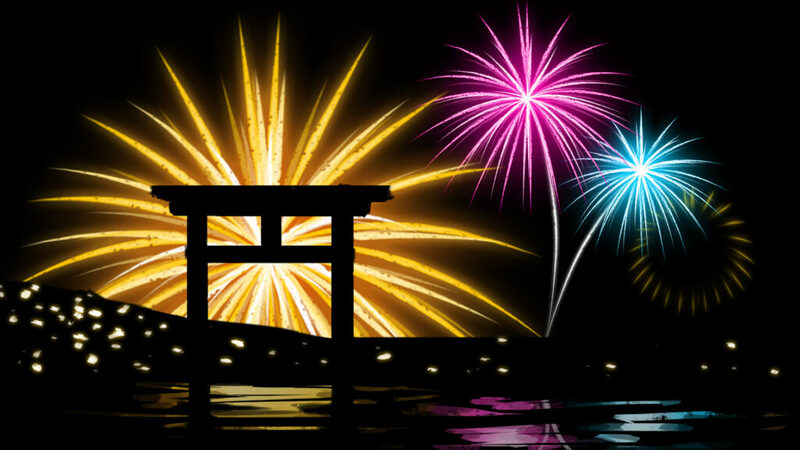 Celebration of the お正月おしょうがつ・News Years in Japan is marked by several things including bell ringing, and paying attention to the “firsts” of the new year. At midnight on December 31st, Buddhist temples all across Japan ring their 鐘かね・bells 108 times to cleanse humanity of the 108 sins recognized by Buddhism, in a tradition is known as 除夜の鐘じょやのかね・jyoyanokane. From midnight of December 31st and all through New Year’s Day and the 2nd and 3rd of January, 神社じんじゃ・shrines are crowded with people participating in 初詣はつもうで・Hatsumode, the first visit to a shrine (and sometimes a temple) of the new year. During this time wishes and desires for the New Year are made, and new お守りおまもり・omamori charms are purchased for the upcoming year while those from the previous year are returned to the shrine to be burned. Many people also make trips to the 浜はま・coastor to the 山やま・mountains to view the first 朝日あさひ・sunrise of the new year. On New Year’s Day, the 皇室こうしつ・Imperial Family makes an appearance at the palace in 東京とうきょう・Tokyo where they greet the general public and offer them 励ましはげまし・encouragement and well wishes in the coming year. Additionally, people write 年賀状ねんがじょう・nengajo, which are similar to Christmas cards and used to stay in touch with friends and 家族かぞく・family and let them know that you are well and thinking of them in the new year. Children are also traditionally given お金おかね・money by their families. Known as お年玉おとしだま・otoshidama, this tradition got started during the 江戸時代えどじだい・Edo Period when large stores and wealthy families gave out bags of 餅もち・mochi and a みかんorange to spread happiness. Kadomatsu門松・かどまつ, a decoration made of three bamboo logs (each one a different length), pine松・まつ and plum梅・うめ tree boughs also grace the entrances to homes, offices and other businesses from the day after Christmas to the 7th of January. They are symbolic of a temporary 家いえ・home for the god Toshigami, who can make the year’s harvest bountiful, and lend a splash of color and warmth to the cold winter season.